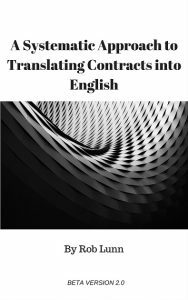 I’ve just updated my ebook on translating contracts. You can download it from this page. The title — the metaphor has gone. The structure and formatting — to make it more readable. Tip 1 — to make it more understandable. I still want to make major changes to one of the early chapters, but I’m going to wait until after I’ve done my workshop at METM17 and maybe even after the webinar I’m doing with eCPD in February 2018. The final version will come after that. Thanks to everyone who gave me feedback on the first version. It is much appreciated.